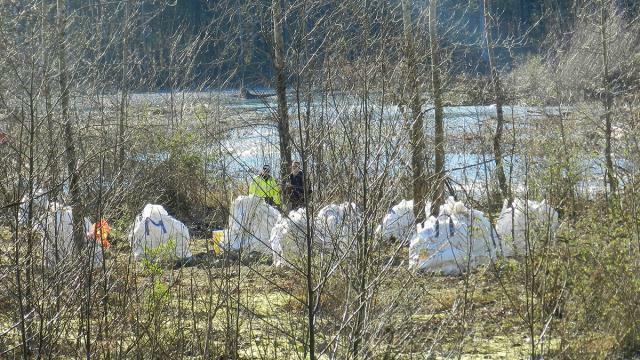 Dec. 6, 2017 4:12 p.m.
More than 1,000 syringes, evidence of cooking methamphetamine, along with huge piles of garbage and stolen items were among what was found at a homeless camp on the banks of the Chilliwack River as cleanup began Tuesday. Natural Resource Officers from the Ministry of Forests Lands and Natural Resources (FLNR), accompanied by RCMP and Griffin Security, finally attended to the notorious camp known to be the final destination for stolen goods from nearby Chilliwack properties. Not surprisingly, it also turned out to be rife with evidence of drug use. “We have just about filled a five-gallon sharps container,” Brian Goldstone with Griffin Security said Tuesday evening of 1,315 needles his team gathered at the site on the north side of the river just up from the Vedder Bridge near Teskey Rock. Drew Goldstone of Griffin said when they opened up one tent they found what appeared to be evidence of not just drug use but a meth lab, littered with butane tanks and a harsh chemical smell. After the careful sweep of the camp by Natural Resource Officers and security on Tuesday, the job of piling the garbage and debris began. On Wednesday, a helicopter began lifting 50 large totes and four nets full of trash and metal from the site to a staging area and a waiting garbage truck on the Soowahlie First Nation across the river. Some neighbours and river users had complained about the individuals in the camp for months, pointing to obviously stolen goods throughout the camp and the environmental mess as water rose. The site is subject to a special order under section 58 of the Forest and Range Practices Act forbidding any camping of any kind by anyone on the property. Camping there is also a violation of the Land Act. Trespass notices were issued to the campers on Nov. 28, ordering them out within seven to 14 days. Where the campers have gone is unclear, although Natural Resource Officers (NRO) at the scene said they asked, and all those in the camp were co-operative and said they had other places to go. Representatives from social services and the Salvation Army have already visited the site to talk to campers. While The Progress was talking to officers near the road on Tuesday, a young man on a BMX bike rode further into the Chilliwack River Valley. He had a backpack with a chainsaw strapped to it and an axe handle sticking out. Moments later three other individuals made their way east on Chilliwack Lake Road. Rumours of another camp further up the valley could not be confirmed, and the officers were not aware of one. Asked what took so long for the crackdown and cleanup — which will be expensive particularly because of the helicopter — one NRO said compassion was part of it. But the practical problem is one of resources. NROs Robert Cunneyworth and Curt Bueckert said the wildfires this summer further strapped resources at an already busy Chilliwack office. 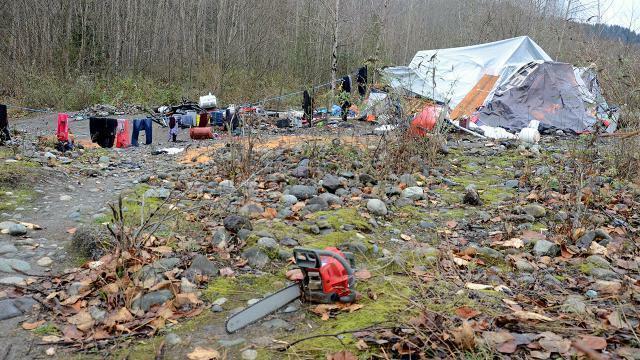 The camp on the Chilliwack River has been there for months, at least since another nearby camp was dismantled in March. There, officials removed more than 17,000 pounds of garbage and hundreds of syringes. The NROs on Tuesday confirmed that some of those in the camp being dismantled this week came from that first camp. See www.theprogress.com this week for an update on the cleanup and a total of syringes found.